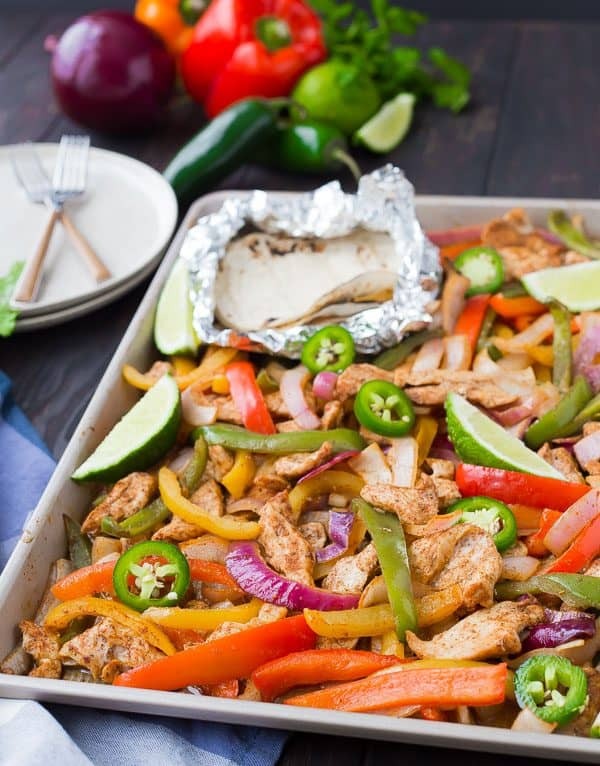 Sheet pan fajitas are great for busy weeknights and also great for bigger crowds! 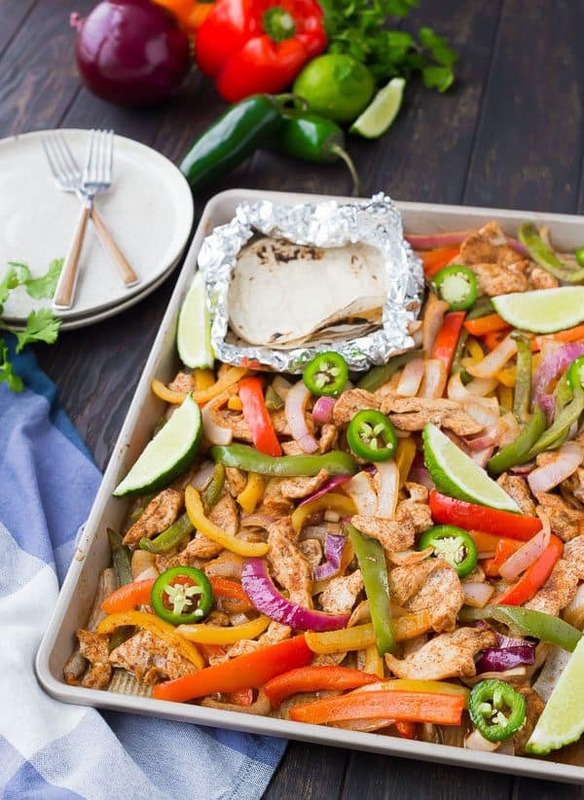 You’ll love this easy, hands-off approach to fajitas! 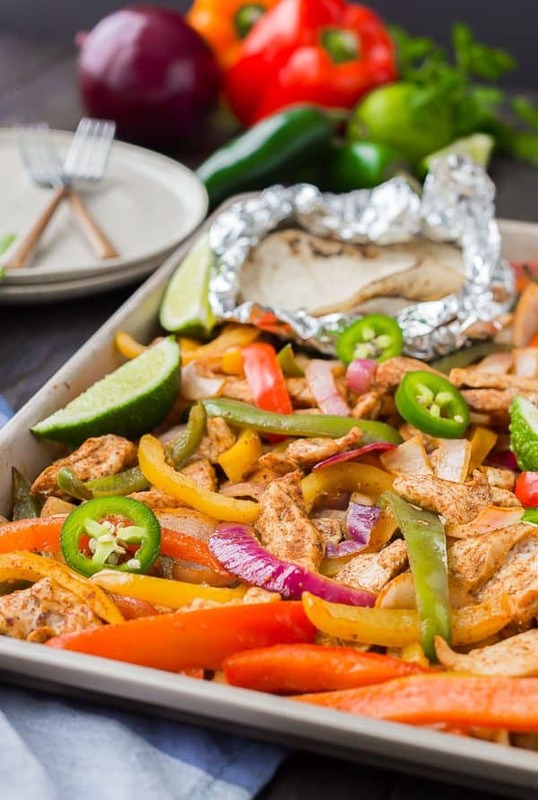 This recipe is for chicken fajitas but you’ll also find tips for steak, vegetarian, and shrimp fajitas! One of Ben’s favorite meals is fajitas. I love them, too. They’re healthy and fresh if you want them to be, or loaded up with cheese and sour cream if you want them to be. They’re something that comes with alllll the toppings, which automatically makes them one of my favorite things. If we’re being honest, I’d be happy eating a bowl of just toppings – sour cream, guacamole, tomatoes, cilantro, cheese, green onions, I’ll take them all! Fajitas are similar to chili in that regard, I’m basically just there for the toppings. PS: Speaking of chili, if you’re looking for a great chili recipe, I have you covered. This Instant Pot Chili is Whole30 compliant, but I give tons of tips to make it not-Whole30 compliant, as well as how to make it on the stove and in the slow cooker. It’s a great resource! 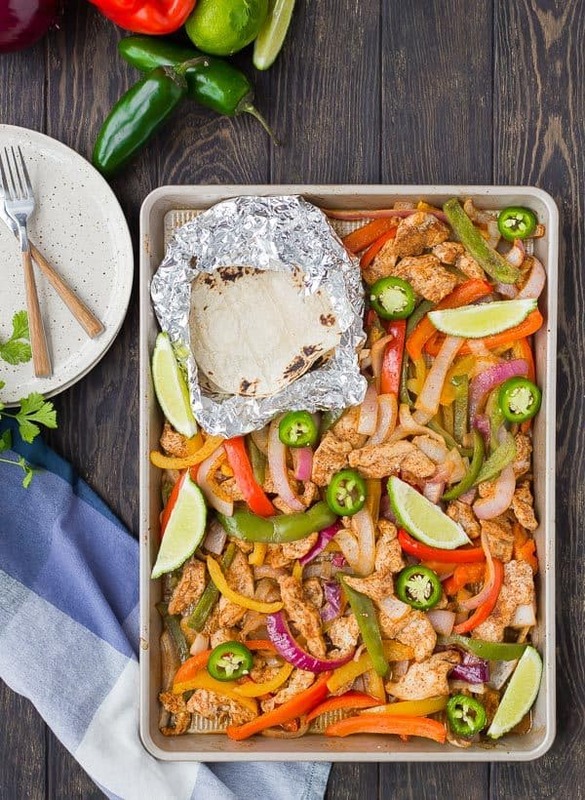 Now, you may be asking yourself, what’s so great about sheet pan fajitas? Why can’t you just make them on the stovetop or the grill? Why a sheet pan? 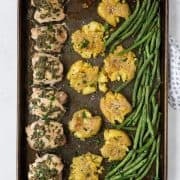 Well, it’s obviously no secret that I’m obsessed with sheet pan dinners, but that’s not the only reason for using this method. I already mentioned the toppings, but we didn’t talk about about prepping the toppings. The great thing about making sheet pan fajitas is that they’re completely hands-off when you’re cooking them. Use that time to prep the toppings. Alllllll the toppings! Shred the cheese, chop the tomatoes, make your guacamole, pluck the cilantro leaves from the stems, etc. 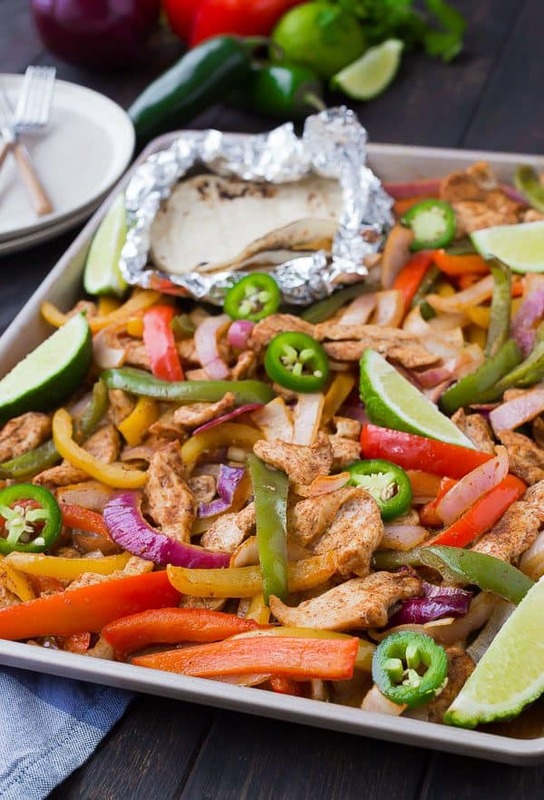 You have all the time in the world to do it while the sheet pan fajitas cook in the oven. I use my homemade fajita seasoning because it’s easy and I always have it ready to go. If you don’t want to do homemade for some reason (you definitely should, though! ), you can shortcut it by just using a combination of chili powder (1 1/2 teaspoons), cumin (1/2 teaspoon), salt (1/4 teaspoon) and black pepper (1/4 teaspoon). They won’t have the exact same flavor but it will work in a pinch. If you want to make it a little more interesting, add 1/2 teaspoon garlic powder, 1/2 teaspoon paprika, and as little or as much cayenne as you like. Want to use steak? Go for it! I personally think chicken is better for this particular recipe – if I’m eating steak fajitas, I want a nice grilled flavor on that steak. It will work though – thinly slice it and cook it the same way. Want to make shrimp fajitas? You can definitely use this recipe! Give the vegetables a head start and add the thawed, peeled, deveined shrimp in the last 10 minutes of cooking. You’ll have to divide the spice and oil mixture to do it this way. Want to get some prep done ahead of time? Aside from making the fajita seasoning, you can also prep all the vegetables the night before. Pop them in a bowl or a zip-top bag and all you’ll have that much less chopping to do when you’re ready to make the recipe. Serving Suggestion: These southwestern oven roasted sweet potatoes would fantastic served alongside these fajitas, PLUS they cook at the same temperature in the oven and require about the same length of cooking time. Also great would be cilantro lime rice or easy sautéed fresh corn if it’s in season. 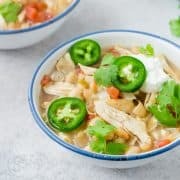 If you’re loving the idea of a southwestern feast cooking on a sheet pan in your oven, try my Vegetarian Nachos, Sheet Pan Chicken Quesadillas from The Cookie Rookie, Sheet Pan Chicken and Black Bean Nachos from The Baker Mama, or Huevos Rancheros Sheet Pan Nachos from Melanie Makes. This taco pasta is also a huge crowd pleaser, and it’s made in ONE PAN in only 30 minutes. 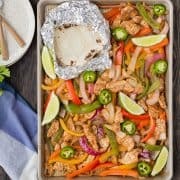 Sheet Pan Fajitas - Easy Recipe for Chicken Fajitas! 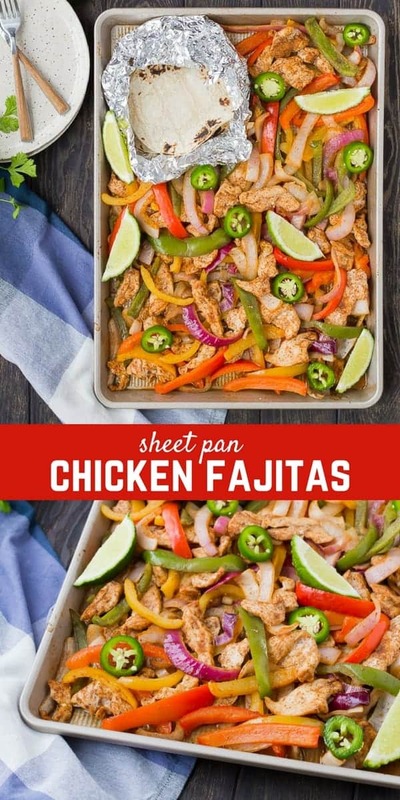 On a large rimmed sheet pan, toss the sliced chicken, bell peppers, and onions with olive oil and fajita seasoning until everything is coated (I like to use my hands for this). Place pan in preheated oven and bake for 15 minutes. Stir and bake for 10 more minutes or until internal temperature of chicken reaches 165 degrees Fahrenheit (check a thick piece). Serve immediately on tortillas with your favorite toppings. These are great if you’re serving a larger group – double recipe and use two sheet pans so they aren’t over-crowded. I love to use corn tortillas but flour will also be great with this recipe. You can wrap them in foil and add them to the oven in the last 5 minutes of cooking time for nice warm tortillas. Verdict: These are SO easy and so delicious! I’m a fan. Husband’s take: Ben has so happy that I made fajitas – no complaints from him! Changes I would make: None are necessary but scroll up a little if you need some ideas to make these your own. I want to make this recipe. What size sheet pan? 11×17 – a standard half sheet pan. I hope you love the fajitas, Ann! I made your fajita seasoning and taco seasoning. The fajitas are in the oven now! It smells so good!! 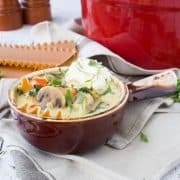 I made these last night for dinner and my family loved them! No complaints from my 8 year old or 6 year old twins! I also made your home made fajita season and it tastes just like something you would have at a restaurant. I will definitely be making these again. So quick and easy! Oh, I am so happy! Thanks for taking the time to come back and leave a comment. It means so much to me!